Kindly accept Sweet Godly remembrances and our Spiritual Greetings of Love & Peace from Ishwari family. We are very glad to read the Vol. 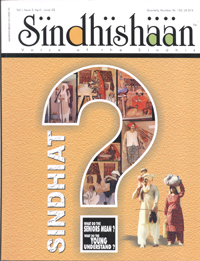 1 Issue 2 “Sindhishaan” magazine. We have displayed the same on our notice board and all are reading the same with keen interest. Moreover, all the tourist visitors also get information about our spiritual activities, services rendered by our institution to encourage communal harmony, wishing well being of all and flourishing universal brotherly-hood in all religion. Every word published by you with love and affection has become a source of inspiration to all readers. We are pleased to once again express our grateful thanks to you and our colleagues and wish you success and prosperity and hope your esteemed magazine will become a source of inspiration to all.